AN AGGRESSIVE Bedouin horde, drunk on religion, sweeps out of the Arabian peninsula - on the way burning the great library of Alexandria - and, through wholesale massacre and forced conversion, imposes Islam on a vast area stretching from Spain to the fringes of China. If this is your mental picture of the rise of Islam, dimly remembered from some long-ago history lesson, take note: it is in almost every respect wrong. Hugh Kennedy sets out to explain an historical puzzle. How could Arab forces, relatively small in number and with no particular superiority in weaponry, have pulled off such an apparently impossible feat? In the century that followed the death of the Prophet in 632, they challenged two established empires (the Byzantine and Sasanian). They conquered Syria in eight years, Iraq in seven, Egypt in a mere two and Spain and Portugal in five. At the same time, they pushed deep into Central Asia and the Indian subcontinent. How did they do it? Why did they not meet stronger and more sustained resistance? And, no less of a mystery, how did the empire they created endure? By painstakingly reconstructing the series of Arab conquests, Mr Kennedy paints a picture strikingly at odds with the popular cliches. 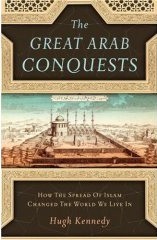 "The Muslim conquests", he writes, "were far from being the outpouring of an unruly horde of nomads." The Bedouin of Arabia were tough and highly mobile, fired by tribal honour and love of booty as well as by zeal for Islam. They were led by intelligent men from the Meccan elite who knew they had to channel the "frenetic military energies of the Bedouin" outwards, or else face a real risk of implosion. These leaders also seem to have grasped that to have based their conquests on mass killings and conversion by the sword would have been a fatal mistake. There were massacres, but they were not the norm. If conquered peoples paid tribute and did not make trouble, they were largely left alone. Local people were incorporated into the new administrative class. Existing religions - Christianity in Syria and Egypt, Zoroastrianism in Persian-ruled areas, Hinduism and Buddhism farther east - were not persecuted. Large-scale conversions came much later; at the time there was little or no pressure on the conquered people to convert. As for the sack of the Alexandrian library, that, says Mr Kennedy, is a discredited myth. . . .